The CDR System has been the industry standard for assessing cognitive function in worldwide clinical trials for over 30 years. Two recent publications highlight how the tool has been used in clinical trials, and how it may be possibly utilized in future programs. The first is a publication of the largest normative database ever developed for an automated test system. 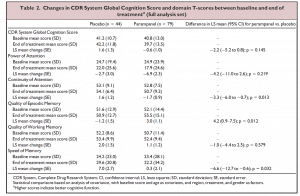 These data further reinforce the widespread utility of the CDR System in clinical research, providing a valuable reference source to help interpret the extent to which compounds may impair or improve cognitive function. These data should be especially helpful for drug developers working with new compounds in drug classes where possible neuro-toxicity is an issue. The Phase III study conducted in adolescents into the cognitive effects of a novel treatment for refractory epilepsy further attests to the suitability of the CDR System for use in pivotal trials in any clinical population. These research data lend important insight to both drug developers and clinicians working in this area. A system which can be used in the first-to-man administration of a compound through to the registration programmes is invaluable to developers of novel medicines, and this latest example further establishes the CDR System as the current gold standard for worldwide drug development of any compound which may influence cognitive function. FULL CITATION: Cognitive effects of adjunctive perampanel for partial-onset seizures: A randomized trial.Epilepsia. 2016 Jan 1. doi: 10.1111/epi.13279. FULL CITATION: Norms for healthy adults aged 18-87 years for the Cognitive Drug Research System: An automated set of tests of attention, information processing and memory for use in clinical trials. J Psychopharmacol. 2016 Jan 11. pii: 0269881115625116. AUTHORS: Wesnes KA, McNamara C, Annas P.